This dessert contains no added sugars! 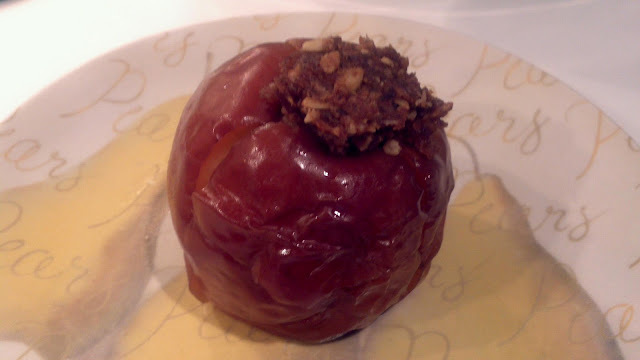 I used Royal Galas, which are a naturally sweet variety of apples, and pitted dates to provide sweetness. I used natural peanut butter and coconut oil for the fat component (instead of butter), but you can use any nut butter of your choice. Almond or cashew butter would provide a more mild flavour. This dessert is mildly sweet, so you could adjust your spices (I used cinnamon only, but nutmeg, ground ginger, or pumpkin pie spice would also make great additions) to add more flavour without adding sugar. You can use your slow cooker or bake them in the oven, the preparation is the same. With a paring knife, slice a small circle around the stem of the apple, cutting about 3/4 of the way down. Using a small spoon (I used a 1/4 tsp measuring spoon), scoop out the stem and hollow out the apple core, leaving the bottom of the apple intact. Discard the core, and repeat with three remaining apples. In a food processor, combine oats, peanut butter, dates, cinnamon and 2 tsp of coconut oil. Pulse until dates are blended. Scoop oat mixture into each apple and place the apples upright in the slow cooker/roasting pan. Drizzle remaining 1 tsp of coconut oil on top of oat mixture portion that is overflowing from the apples (1/4 tsp on each apple). Pour water into bottom of slow cooker to surround the apples. Place the lid on the slow cooker and cook for 2 hours on high, or 4 hours on low. Preheat oven to 350 degrees F. Pour water into bottom of roasting pan to surround the apples. Bake for 30 minutes, until apples are tender.